Wool and flax were key materials used for making clothing in Bible times. My mother and mother-in-law are talented seamstresses, but I chose not to master that craft (okay, let’s be honest, I even have Hubby sew buttons on at our house). Sewing is not something I enjoy, but I do enjoy the fruits of other people’s stitching. I don’t make clothes for our family, but I love looking for good deals on clothing. I think sewing is too in-the-box for me. Following specific directions is not easy or enjoyable for me either. I prefer to exercise my creativity through experimenting and impulse. Take my cooking for example, I delight in using a little bit of this or that to make meals with the ingredients that we have on hand. This approach has gone wrong in the past, but over time, through trial and error, I have a handle on what tastes good together. The second part of this verse, “[She] works with her hands in delight” is quite convicting to me. But maybe not in the way you might expect. You see, the other night, before our 10K race, my husband and I stayed up late, whispering. He said words that I desperately needed to hear but feared hearing at the same time. Let me back up a bit. I am usually a pretty calculated person, while not great at math, I often count the cost and run a checks-and-balances system on what I say “yes” to. When there are big decisions to make, or new adventures on the horizon, we pray, ask God for scripture to stand on, seek wise counsel, and analyze the circumstances. When most, or all, of these align we move forward. Coupled with an abiding relationship with Christ, this can be a great tool (as found in Experiencing God) for discovering God’s will. However, in mid-February, as I launched this site, started writing a book, and got much more serious about my writing in general, I didn’t calculate everything. This was a good thing for me, who keeps herself on a short leash, to be somewhat impulsive and just “go with it”. My fears, of just letting myself go and living free versus living disciplined, are that I will get out-of-balance and lose control. I tend to be an all-or-nothing kind of gal. When I am passionate about something, I am all in. These can be a good thing but it also can be detrimental. I’ve often criticized others, in ministry especially, for being workaholics. Then I realized I was demonstrating similar tendencies with my creative endeavors…I was just doing them from home, thus the unhealthy behaviors weren’t as obvious. Staying up late, not getting enough sleep, and neglecting the present in pursuit of the future. I was working with my hands in delight, but I was sacrificing my greatest delights, my husband and kids, in the process. That’s basically what husband whispered. I knew it was serious, because he waits as long as possible to confront. He confessed that he was becoming resentful. I knew he was right. I knew I was out of control, but like an addiction, didn’t feel like I could change without intervention. His timely words were a wake-up call. He was going to bed alone and waking up with me already gone. 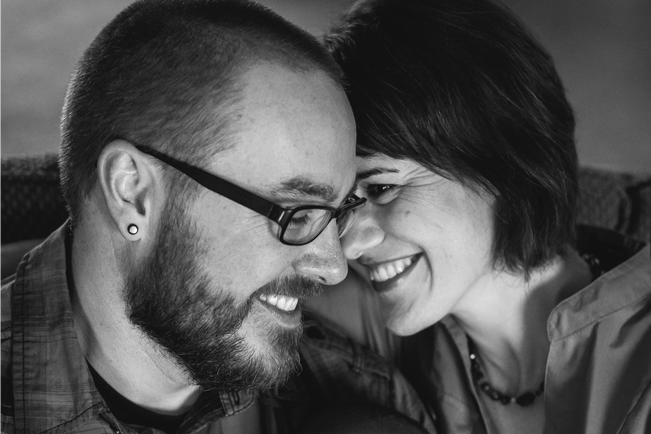 I realized, my “passions” were taking the passion right out of our marriage. Ministry was becoming a mistress. It was hard to hear, but also life-giving. It reminded me a little bit of when King Theoden is called back to life by Gandalf in The Lord of the Rings: The Two Towers. Gandalf spoke powerful words to break the spell that had blinded Theoden. And then Theoden woke up…it is here we pick up their dialogue. Gandalf: Breathe the free air again, my friend. Theoden: [stands up from the throne] Dark have been my dreams of late. Gandalf: Your fingers would remember their old strength better… if they grasped your sword. Unlike the curse that Theoden was under, God-sized dreams are a blessing and they produce life. But, when they creep up to a place of rule, taking over and keeping us from our greatest dreams, they begin to cloud our vision and the results can be devastating. When I am confronted or hurt I am tempted to retreat. Hubby knows this about me. I am tempted to throw the baby out with the bathwater and go to the other extreme. As he spoke, I wondered if I needed to give up on this writing dream. But, as we whispered in the dark, he wasn’t asking me to give up or even delay this God-sized dream of writing, he was just asking for balance. He was just asking for my work to not take over and suffocate the delights found in our marriage and in our family. My dreams were clashing and it was time to give priority back to the greater dream. Both dreams, of writing and being a present wife and mom, are good, but one is more important to me. However, just because these dreams clash at times doesn’t mean they contradict, just that I need to be mindful of my methods. It is true that God-sized dreams can take large quantities of time, but when they are taking most of our quality time, there lies an issue. These verses came to mind after we talked, “Husbands, love your wives, just as Christ also loved the church and gave Himself up for her; that He might santicfy her, having cleansed her by the washing of water with the word, that He might present to Himself the church in all her glory, having no spot or wrinkle or any such things; but that she should be holy and blameless” (Ephesians 5:25-27). I had neglected my sword. His Word. The words that keep me grounded and free, that keep me from tail-spinning out of control. Words that call me back, to yield to His Kingship and enjoy the benefits and liberty found in His covering. I was pouring out but not taking the time to let Him pour in and keep me centered. I had neglected the Word that I love and started loving my words more. His words were direct, not harsh, but gentle and full of affection. He wants me back. He’s not asking me to give up what’s in my heart, but to stop operating from a fragmented heart. He longs to clothe me in fine clean linen and present me as a spotless bride. I want the work of my hands to be a delight to those I delight in most. I am thankful for my family’s continual support of my writing, and I want to honor Him and them by operating in health and balance, to be present and not miss the life that I am writing about. What are your hands delighting in? It is a good thing to have hobbies and interests but when they take over and hold us hostage it is time to reevaluate. Maybe these whispers from our Heavenly Husband are for you too? I pray, if needed, they serve as a wake up call- to balance, to living free and full. 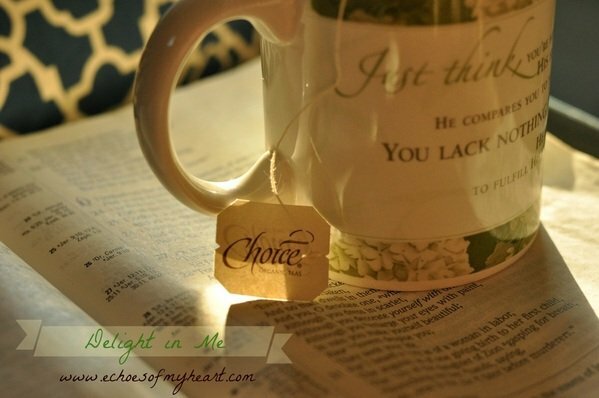 Linking-up on Wednesdays with Women to Women, Coffee for Your Heart, Three Word Wednesday, Words of Life Wednesday and #TellHisStory. Won’t you join us as we encourage one another with His Truth? See the sidebar for all the buttons that link you to these wonderful communities. Katie, thank you for your timely words. It’s time to check myself and check to see if I’m in balance. I have let ministry be my mistress in the past too, and it was ugly. Your words are perfect and powerful here. Many need to read them. So glad I did this morning! Thank you for allowing God to use your story to impact others! Katie, I too tend to give everything up if I become out of balanced. It seems the only way to keep in perfect peace is to stay in God’s word, abide, and be thankful that God is never out of balance. I love how your husband gently gave you perspective. What a gift! Thank you for sharing. Beautiful post! May we keep His Word in our hearts & minds each day. The only way we will win a battle. Loved this post! Thank you Joanne- yes, so true. His Word is indeed a lifeline and plumb line. Balance is so hard to find. 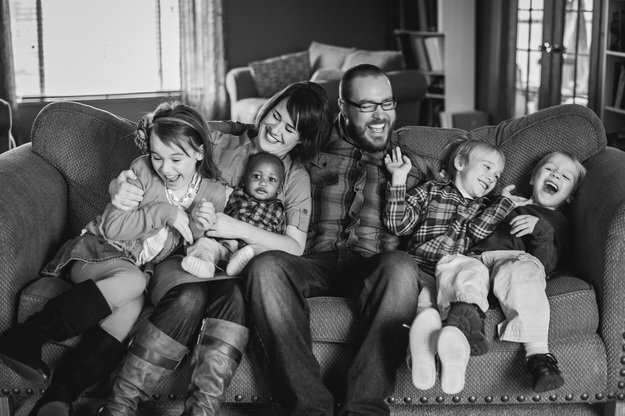 I often struggle to balance writing, ministry and being mother. But somehow God helped me finish writing a book when I had an infant. You can do it! God will show you the best way for you and your family! Good luck! Thank you Jennifer. I needed that hope and encouragement. :) Congrats on your book! Oh Meredith, Thank you for this- “blessings in finding your balance”- you too friend. And this, “God can and will see the others through if I keep my priorities in check.” Great reminder. Thank you Kaite for your honesty. It’s nice to know I’m not alone in the creative purpose, family, balance war. I’m a recovering yes girl and learning how to ask God before jumping in has been a difficult lesson, but HE is good, and I’m learning how to say no and prioritize – one no at a time! THANK YOU! Thank you for sharing this, Katie. I struggle to find balance with my writing too, and I know it isn’t meant to interfere with my relationships with my husband or my family. It must glorify Him, or it doesn’t mean anything. Thanks for sharing. This post was a delight to my heart. Your words echo your talent as a writer and your heart as one who desires to delight your family. Thank you for sharing your “balancing” view of both your God-sized dreams.It’s an inspiration and blessing! So glad I stopped by from Holley’s today. Thank you for sharing so honestly and vulnerably. Seeing as it is late, you may know that I too am seeking balance in all this. 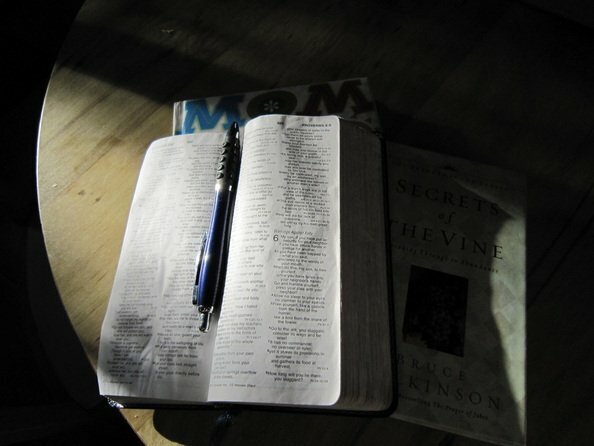 It is so easy to let this happen: “I had neglected the Word that I love and started loving my words more.”. Thank you for your exhortation and reminder to be in the Word of God. We need to constantly encourage one another to do this and build one another up with the Word. Beautiful writing, beautiful heart, Katie. Rebekah, Thank you for your honesty too- it is an encouragement to me. Praying He grows our appetite for His Word and that we feast upon it. :) Thank you for hosting Words of Life Wednesdays! Katie, this really resonated with me. With my husband gone I have spent much more time on my writing and taking the time to visit and encourage other. I do still have one child at home though and there are too many times when I’m choosing what comes with this writing over time with him. I’m also reminded that when my husband does return home changes to my routine would need to made. But there are also moments I choose writing over time in His Word. While God has called me to write, first and foremost He wants to nourish me…refill me. Finding that balance is so important. I was also just very moved by the obvious love between you and your husband through how you shared your heart. Beautiful! Blessings to you. Thank you Beth for your thoughtful, kind words. You are such an encourager- I hope that others are encouraging you. :) Blessings- have a great, fun-filled weekend.